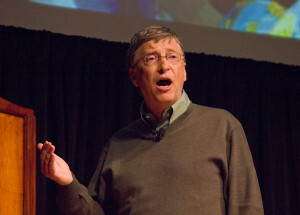 Gates encouraged students to travel to places of poverty and expose themselves to these development issues, noting that nothing can replace on-the-ground experience. “As I look back on my university experience I wouldn’t change anything but one thing, which is that I definitely got through school without having a sense of how the poorest in the world lived,” he told the audience assembled in Cubberley. Gates spoke primarily on health and agriculture, the two main areas of focus for The Bill and Melinda Gates Foundation, which Gates founded and currently co-chairs. Gates brings optimism to his philanthropic work and sought to impress this on his audience. “I want to give you a sense of optimism, excitement about the progress we’re making,” he said, beginning his presentation with graphs showing dramatic progress in global child mortality, hunger and poverty. Such upward trends, however, do not always reflect the situation in the poorest parts of the world, he said. “If you take Africa as a whole, because of population growth, they’ve made very limited progress against their poverty percentage,” Gates said, stressing the importance of continued aid and focus on the continent. Gates cited that more money has been spent developing drugs to combat baldness than to fight malaria. Innovation provides the key to this effort, Gates said. Gates presented three products in particular to demonstrate his theme of innovation, noting that the developing world requires innovation where the developed world does not. The Gates Foundation has been integral in manufacturing and distributing a vaccine for Meningitis A, which recurs every few years in the “meningitis belt” of sub-Saharan Africa. Partnering with Indian manufacturer Serum, the foundation hopes implementation of the vaccine will decrease disease levels by at least 90 percent. The vaccine, the first developed specifically for Africa, only needs to be administered once and is manufactured cheaply. Fifty million people have received vaccinations so far, Gates said. The next innovation Gates highlighted touched on what could be a culturally sensitive issue: circumcision. While an AIDS vaccine may be over a decade away from development, male circumcision has been shown to reduce the transmission of AIDS by over 60 percent, Gates said. Gates highlighted a circular, plastic ring, “Shang Ring” or “PrePex,” that renders circumcision surgery much more efficient, sometimes taking only a few minutes. “It reduces the pain involved, it reduces the cost involved,” Gates said about the ring, adding that it would cost about $1 billion to roll out circumcision initiatives of this kind across Africa. “It’s just plastic,” he said of the simple solution to the complex health issue. The agriculture advance Gates presented also emphasized a simple solution to a devastating problem. A more efficient, triple-layer storage bag now stops weevil infestations in cassava, a protein-rich crop in West Africa. With two layers of polyethylene and an outside layer of plastic mesh to trap and suffocate weevils, these bags make a huge impact on post-harvest loss: 1.7 million households were able to increase their income by $150 dollars, or 30 percent, due to the triple-layered bags. Prior to his talk, Gates met with faculty and students conducting research on campus related to global health. President John Hennessy, despite being on sabbatical since February, introduced Gates before his talk, recalling a conversation 15 years ago when Gates told him he was “too busy” for philanthropy. “He said that he was too busy leading Microsoft and didn’t have the time to be a thoughtful philanthropist,” Hennessy said, noting the dramatic shift in Gates’ career. Gates acknowledged that he didn’t enter the world of philanthropy until later in his life, though he encourages Stanford students not to wait. Following the talk, Hennessy presented Gates with a solar lantern created by students in Design for Extreme Affordability, a course that shares Gates’ mission to harness innovation to solve problems in the developing world.